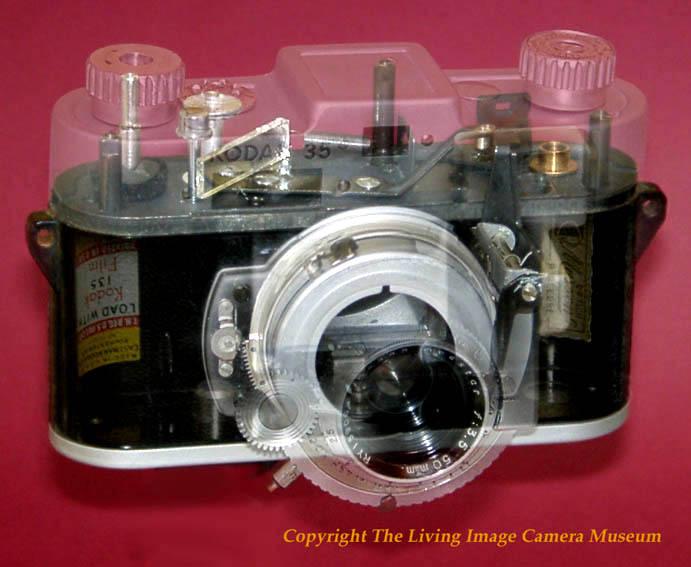 The first US produced Kodak 35mm camera was an unpretentious "Bakelite" bodied product which served as the basis for this odd looking creation. Due in part to it's heritage, some of the mechanics ended up on the outside, notably the coupled rangefinder cam follower arm which was hidden under that rather noticeable cover. The whole design does give the impression of a series of assembled afterthoughts. For this reason alone it attracts interest. The choice of finish is unusual too, it is a matt satin chrome plate. This example, dating from 1950, was donated to the collection in Jan 2006 and was coated in a good layer of dust. It was subjected to a deep clean during which it was completely stripped. This process revealed that the camera was robust, if not especially refined. The shutter cocking ring was a weak point in particular, with the stamping burrs not being removed. This made the wind on crunchy and in the interests of longevity this failing was polished out . The shutter, whilst following Compur practice is nowhere near as well made, but still works reasonably well. The small gearwheel that engages the focus teeth around the lens is there to prevent the operator's hand from obscuring the rangefinder window. The rangefinder viewing window may have the dubious distinction of being the smallest ever.